Do you want to create a stunning dessert at home but don’t have time to cook? This pie is for you! It’s so rich, delicious and pretty no one will guess that it all came from packets. All that is required to put this dessert together is a little bit of effort and, best of all, not too much cleaning up afterwards. Perfect for entertaining! I had never heard of a Banoffee Pie until I started watching the television series Come Dine With Me where it featured often. Now that I have tried it for myself I understand why it is so popular; it’s so easy to make yet still so good. 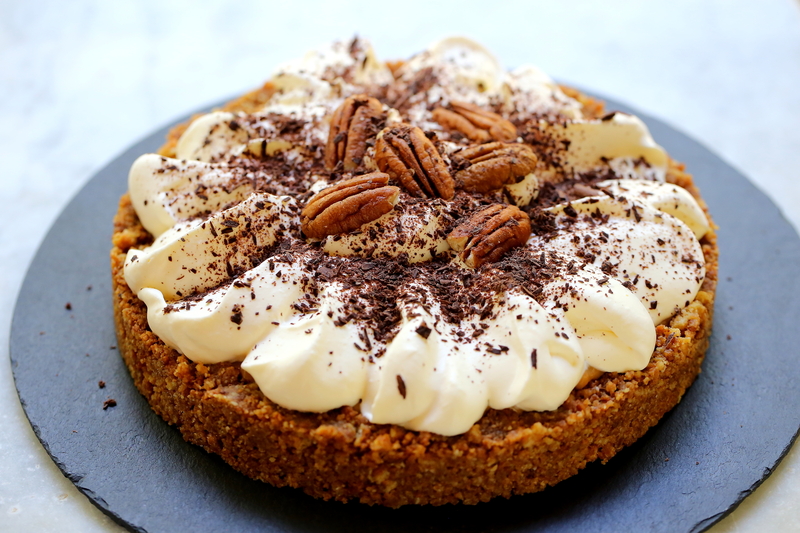 Have you ever eaten a Banoffee Pie? Do you have a favourite recipe? Process the cookies in a food processor until it resembles a crumble. Combine the cookie crumbs and melted butter in a large bowl and stir until the crumbs are evenly coated with the butter. Pour the crumbs in to a 20cm (8 inch) loose bottom flan tin or lined springform cake tin and press until the crumbs evenly cover the base and 2cm up the side of the tin to create an edge. Place in the fridge to chill and firm (about 30 minutes). When the base is ready gently remove it from the tin and place on a serving plate. Peel and slice the banana and lay the slices on the base. Reserve 6 pecans (about 15g) and chop the remainder. Sprinkle the chopped pecans over the banana. Spoon over the caramel and smooth. Top with whipped cream, grated chocolate and the reserved pecans. Posted in Fruit, Pies & TartsTagged banana, easy dessert, no bakeBookmark the permalink.